With four CEOs in a decade, three chairmen, and a rotating array of directors, HP has repeatedly tumbled into turmoil. A guide to the key figures. 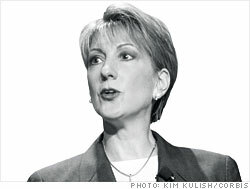 Mediagenic and a strong marketer, Fiorina bought Compaq for $24 billion, arguing HP would win by being No. 1 in PCs. But she was weak as an operating executive, and the board ousted her.